Second application round has closed! Questions about the International Summer University Programme? For quick guidance and general information, contact Student Hub. For guidance on specific programmes, choosing electives, and the like, find the student guidance counsellors for your programme. CBS is located in Frederiksberg, close to the heart of Copenhagen. See CBS locations for more details and how to get to a specific building. Home to Creators Floor (a cooperation between the office community Symbion and CBS targeted entrepreneurs). Some classes take place here. For how to get to CBS by public transportation please check Rejsenplanen/Journey Planner. After you have been enrolled in ISUP, you will receive a letter with your username and password if you are a first time student at CBS, if you are currently enrolled or if you have been enrolled at CBS before, you will not receive a new login, but you should simply use your current/old account. Your username will never change, but your password expires every 3rd month and must be updated on help.cbs.dk. Please note that your CBS login will be valid 3 months after your last exam. Register your personal contact information on help.cbs.dk. You will then receive a reminder when your password needs to be updated, and you will be able to reset it yourself. My.cbs.dk is the student intranet for students enrolled at CBS. Here you can find information regarding exams, studies, contact informations to verious CBS units, student life ect. After you have been admitted to the programme, the ISUP Secretariat will send your CBS username and password, which is needed for logging in. You should receive this by mid/end-May at the latest. Find course information, preliminary assignments, additional material etc. The exam system, Digital Exam, is used at CBS to administrate exams digitally. The system lives up to the Danish governments strategy for digitalisation of university exams and supports a modern and digitised approach to conducting and assessing exams. The system is digitalising the entire exam process: from Planning the exam, transferring data from STADS, presenting the assignment to the students, conducting and submitting the assignment, to automatic forwarding of the assignment to the assessors, grading and automatic registration in STADS. The ambition is that no paper will be needed at any point in the process. How do i access Digital Exam? I have problems uploading my exam project, what do I do? CBS supports the idea of a green campus and as a result, there is a limited number of options for printing. The Library at Solbjerg Plads offers print at the cost of DKK 1,50 per page. You do not need a print card or installation - you should simply go to one of the CBS Library computers and send your print to "Library Print DKK 1,50 per page". Prints are picked up and paid for in cash or by Mobile Pay at the "red information desk" inside the library. Please note that printing in colour is not available. Distance in minutes on foot from Solbjerg Plads 3. Occasionally, students abroad have serious medical problems, are involved in accidents or victims of assault. Please state whether you need fire, police or ambulance service The operator will connect you at once. Speak slowly and clearly and give your address and phone number (English will be understood). When calling from a pay phone, no payment is required. your host university (in all cases) - they cannot help you, if they don't know! Remember, the International Office is here to help you. If you find yourself in an emergency situation, please contact us immediately. What is definitely NOT considered an emergency! Question: Do I need a visa to study at ISUP? Answer: Some students who come to Denmark to participate in ISUP will have to apply for a short term visa for the period of the duration of the programme. Since you are going to study in Denmark for less than three months, you will not get a student visa. You can check the Danish Immigration Services homepage to see whether or not you need to apply for a short term visa for entering Denmark. Students from many countries, including the U.S., do not need to apply for a short term visa if their stay in Denmark is under three months. Students, who need to apply for a short term visa to enter Denmark, should apply at the Danish embassy or consulate in their home country as early as possible once they have received their letter of acceptance from ISUP Secretariat as it takes up to three months to get a visa. Please remember that if you need a visa, your passport must be valid until at least three months after the expiry date of the visa. 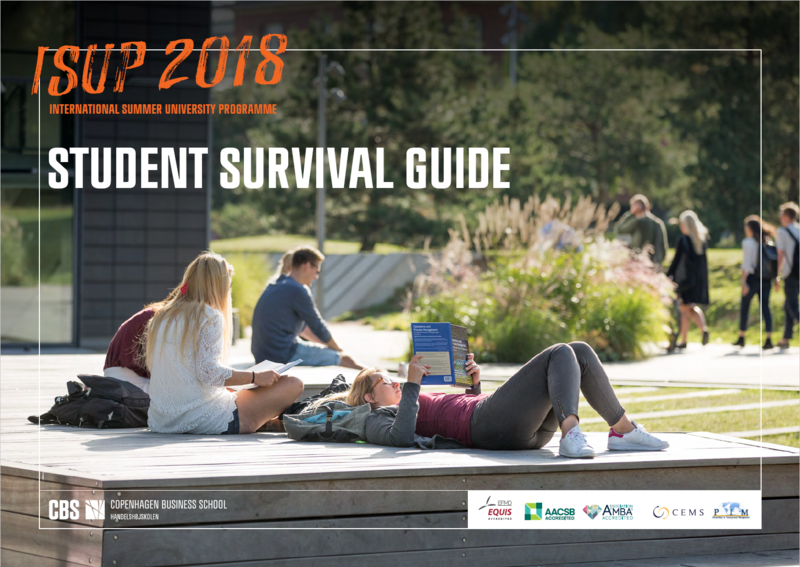 Question: Can I apply for a scholarship to cover my costs for studying at ISUP? Answer: As a state owned institution, CBS has no scholarships to offer to ISUP students. However, it may be possible that your home university has scholarships for taking part in international education opportunities. Question: Why is the course I wish to take not approved on the positive/negative list? Answer: Your study board decides which electives you can take at ISUP. If your desired course is not approved on the positive/negative list please contact your study board for further explanation. Question: The course I want to enrol in is “closed for further enrolment”, can I get on a waiting list for the course? Answer: No, it is not possible to get on a waiting list for courses at ISUP. Even if someone withdraws from the course, it will not open a seat as the courses “closed for further enrolment” all have been overbooked. Question: Can I switch courses if I find out that I need/want another one? Answer: No, it is not possible to switch courses. We will overbook all courses in relation to the number of seats in each course. So even if someone else withdraws, this will not leave a seat to be filled. Question: Will ISUP courses be taught year by year? Answer: ISUP courses are "season courses" and may not be offered year by year. This means that you must pass the last exam attempt no later than November of the year in which you attend ISUP. Question: I am applying as a student with EU/EEA/Swiss citizenship with a course pre-approval from my home university. I have uploaded all documents in my online application except the pre-approval of credit transfer letter. I have applied for a pre-approval at my university, but it is not likely that I will receive it before the application deadline. Can I hand in the pre-approval letter after the deadline? Will my application still be considered? Answer: You have to submit all documentation by the end of the second application deadline, otherwise your application will be rejected. Please note that if you applied in the first application round, but cannot submit all documents by the first application deadline, courses will not be assigned to you after the first application round and you will automatically be considered second-round applicant. If you cannot present a course pre-approval within the application deadline, you have the possibility to change to the student category Open University Students (fee-paying) by sending an email to summer@cbs.dk. You must do this within the application deadline. Please note that we hereafter do not change the student category and/or refund the course fee, even though you hand in your pre-approval. Question: I have uploaded all documents in my online application except a copy of my passport. I have applied for a new passport, but it is not likely I am going to get it by the first round application deadline. What should I do? Answer: If you applied in the first application round, but cannot submit all documents by the first application deadline, courses will not be assigned to you after the first application round and you will automatically be considered second round applicant. You have to submit all documentation by the end of the second application deadline, otherwise your application will be rejected. Question: Can I submit my missing documents by email? Answer: No, you cannot. Please log on to your online application through the link you received in the confirmation email and upload the documentation there. Question: Can I upload my driver's license? Answer: No, we only accept a valid passport or EU/national identity card stating your citizenship. Question: I am interested in taking a course with a basic understanding in finance as a prerequisite. I have yet to take an introductory course in finance, but I believe that I qualify as having a basic understanding of the subject. Is this good enough to satisfy the prerequisite or do I need to have taken a finance course? Answer: In your online application you will be asked to confirm that you fulfil the prerequisites for the course. You will not be asked to document your confirmation. It is your own responsibility to evaluate whether you think you fulfil the prerequisites and will be able to follow the course. Question: I am a first time student at CBS and I have not received my CBS username and password, what do I do? Answer: In the beginning of May we will send all first time students at CBS their CBS username and password by ordinary mail. If you have not received the letter by the end of May, please contact the ISUP secretariat at summer@cbs.dk immediately, and we will look into it for you. Question: I have been enrolled at CBS before, but I cannot logon and reset my password, what do I do? Answer: If you cannot remember your password and you are not able to logon to help.cbs.dk and reset it yourself, please contact CBS IT at help@student.cbs.dk - The ISUP secretariat cannot help you resetting your password. Question: I am a Non-European Freemover and I applied for the ISUP a few weeks ago. However, I still don't know how to pay the tuition fee. Could you please give me the payment information? Answer: The tuition fee should be transferred to the bank account number mentioned in the section Fees and costs under Application and fees. Question: I am an Open University Student and I am wondering when I have to pay for my course(s)? Answer: The payment instructions will be sent to your CBS email account by mid-May, if you have not received your CBS username and password by mid-May, please contact the ISUP secretariat at summer@cbs.dk and we will look into it for you (Please note that it is not possible to get the payment instructions sent to another email address). Question: I am an Open University Student and I have not received my CBS login, can I pay in another way? Answer: No, you need to pay for your course(s) on the Epayment system, where you need your CBS login, if you have not received it by mid-May, please contact the ISUP secretariat at summer@cbs.dk and we will look into it for you. Question: I will arrive before/after 21 June 2019. How will I get a key to my CBS accommodation? Answer: Arrival service will be arranged at a hotel nearby the airport from 9 am to 9 pm on 21 June 2019, where you will receive a key to your CBS accommodation. Please contact our Arrival Coordinator if you arrive earlier or later and if you need to receive a key to your CBS accommodation. Please note that if you arrive in the weekend or after 9 pm on 21 June 2019, you will have to wait until Monday to get your accommodation key. Question: I have an exam at my home university in the first week of the ISUP programme, can I arrive late? Answer: ISUP is a very intensive programme, and we recommend that students come to all classes. However, attending classes at CBS is not mandatory, so you will not be excluded from the programme if you choose to miss the first week of classes. Please note that we will hold an Introduction Day 24 June. It is your own responsibility to get information you missed from your fellow students.